Designed in the USA with greater quality control than other brands. These models are a favourite with beginners and respond well enough for more experienced players. They have similar features to higher end concertinas like traditional riveted action, button layout, spacing and height. All models have a single reed per note. 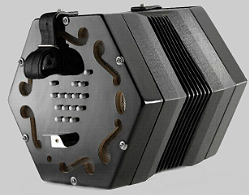 The Rochelle is a 30 button Anglo diatonic concertina, which means it plays a different note on the push and pull. It has a treble or high octave range in the keys of CG with a Wheatstone layout. The low/bass notes are on the left side and the high/treble notes on the right side. 6 bellow folds. Comes with gig bag and tutoring book. See link for note layout. The Jackie is a 30 button English chromatic concertina, which means it plays the same note on the push and pull. It has a treble range that is one octave higher than the Jack (G below middle C to the second C above middle C). 6 bellow folds. Comes with a gig bag and tutoring book. See link for note layout. The Jack is a 30 button English chromatic concertina, which means it plays the same note on the push and pull. It has a baritone range that is one octave lower than the Jackie (second G below middle C to the first C above middle C). 6 bellow folds. Comes with gig bag and tutoring book. See link for note layout. 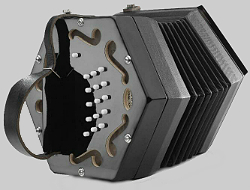 The Elise is a 34 button Hayden Duet concertina. This system is a combination of both the English (plays the same note on the push and pull) and the Anglo (the low/bass notes are on the left side and the high/treble notes on the right side). 7 bellows folds. Comes with gig bag and tutoring book. See link for note layout. All models not stocked. Inquire about availability.